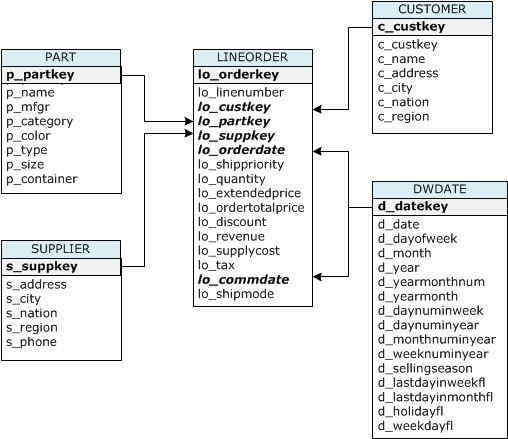 Data warehouse databases commonly use a star schema design, in which a central fact table contains the core data for the database and several dimension tables provide descriptive attribute information for the fact table. The fact table joins each dimension table on a foreign key that matches the dimension's primary key. For this tutorial, you will use a set of five tables based on the Star Schema Benchmark (SSB) schema. The following diagram shows the SSB data model. You will create a set of tables without sort keys, distribution styles, or compression encodings. Then you will load the tables with data from the SSB data set. If you already have a cluster that you want to use, you can skip this step. Your cluster should have at least two nodes. For the exercises in this tutorial, you will use a four-node cluster. To launch a dc1.large cluster with four nodes, follow the steps in Amazon Redshift Getting Started, but select Multi Node for Cluster Type and set Number of Compute Nodes to 4. Follow the steps to connect to your cluster from a SQL client and test a connection. You do not need to complete the remaining steps to create tables, upload data, and try example queries. Create the SSB test tables using minimum attributes. If the SSB tables already exist in the current database, you will need to drop the tables first. See Step 6: Recreate the Test Data Set for the DROP TABLE commands. For the purposes of this tutorial, the first time you create the tables, they will not have sort keys, distribution styles, or compression encodings. Execute the following CREATE TABLE commands. Load the tables using SSB sample data. The sample data for this tutorial is provided in an Amazon S3 buckets that give read access to all authenticated AWS users, so any valid AWS credentials that permit access to Amazon S3 will work. Create a new text file named loadssb.sql containing the following SQL. Replace <Your-Access-Key-ID> and <Your-Secret-Access-Key> with your own AWS account credentials. The segment of the credentials string that is enclosed in single quotes must not contain any spaces or line breaks. The load operation will take about 10 to 15 minutes for all five tables. Sum the execution time for all five tables, or else note the total script execution time. You’ll record that number as the load time in the benchmarks table in Step 2, following. To verify that each table loaded correctly, execute the following commands. The following results table shows the number of rows for each SSB table.